The Croydon Brass Band played at the Celebrate Moorooolbark Festival. The Croydon Concert Band played on Australia Day 2019 at the Ringwood Lake Soundshell for Maroondah City Australia Day Celebrations and Citizenship Ceremony. Croydon Wind Symphony performed Christmas Carols and other items in Main Street Croydon. Croydon Wind Symphony performed Christmas Carols and other items at Eastland Shopping Centre. Croydon Brass Band performed Christmas Carols at a Carols Service at St John's Anglican Church, Croydon. Croydon Brass Band performed Christmas Carols in Main Street Croydon. The Croydon Wind Symphony as part of the Maroondah Carols Band, performed at the Maroondah Carols by Candlelight celebration on the Town Park, Norton Road, Croydon oval. Croydon Wind Symphony and Croydon Concert Band performed in the Maroondah Festival on the Main Stage. Croydon Brass Band played at the Mooroolbark Remembrance Day Service. Croydon Concert Band performed at the Maroondah City Citizenship Ceremony held at the Karralyka Centre. Croydon Brass Band together with the East City Sound Chorus staged a performance with light refreshments at the Melba Secondary College Theatre. The Croydon Concert Band hosted a combined rehearsal with students and staff from Leongatha Secondary College. Croydon Wind Symphony staged a concert at the Cherrytree Grove Retirement Village in Croydon. Croydon Wind Symphony organised and performed in a Dinner Dance at St John's Parish Hall, Mitcham, with guest artists "The Old Dogs". Croydon Brass Band competed at the 2018 Victorian Bands League State Band Championships held in Ballarat. Croydon Concert Band received a Deakin Community Award, presented by Member for Deakin Michael Sukkar. The Musical Director, Andrea Crompton, received an individual award for her contribution to music in the community. Croydon Brass Band members in all age groups took part in the annual Victorian State Solo & Ensemble Championships. There were many winners and place getters. Congratulations to all participants. Croydon Concert Band staged a Soirée & High Tea at the East Ringwood Hall. The band provided musical entertainment with a light meal for family and guests. Croydon Brass Band held a Concert at St John's Anglican Church, Croydon. Croydon Brass Band played at the Mooroolbark ANZAC Day Service. The Croydon Brass Band competed in the Yamaha Australian National Band Championships, in Melbourne. Some details... More information on the Brass Band facebook page. The Croydon Wind Symphony competed in the Yamaha Australian National Band Championships, in Melbourne. Some details... More information on the Wind Symphony facebook page. The Croydon Concert Band played on Australia Day 2018 at the Ringwood Lake Soundshell for Maroondah City Australia Day Celebrations and Citizenship Ceremony. Croydon Concert Band performed Christmas Carols in Main Street Croydon. The Croydon Brass Band performed at the Mooroolbark Carols By Candlelight celebration held at Hookey Park, Mooroolbark. Croydon Brass Band, organised a dinner and performance at the Melba Secondary College Theatre to celebrate their win in the Australian National Band Championships earlier this year. Croydon Concert Band stages a Soirée & High Tea at the Lilydale Baptist Church Hall. The band provided musical entertainment and a delicious light meal for family and guests. Croydon Brass Band and Croydon Wind Symphony competed at the 2017 Victorian Bands League State Band Championships held in Her Majesty's Theatre, Ballarat. Croydon Brass Band played in a concert at St John the Divine Anglican Church, Croydon. The Croydon Brass Band has its first win at a national level with a First Place in the D-Grade section at the Yamaha Australian National Band Championships, Launceston 2017. Some details... More information on our facebook page. We also achieved a mention in the on-line magazine 4barsrest both in some commentary and the final report. The Croydon Wind Symphony organised a children's event as a "Teddy Bear's Picnic" at the Croydon Farmer's Market There were performances by the Croydon Wind Symphony and a "Big Band" consisting of members of the Croydon Wind Symphony and guest players. The Croydon Brass Band played at the 5th National Whippet Championship Show hosted by The Whippet Association of Victoria and held at the Foothills Converence Centre in Mooroolbark. The Croydon Concert Band played on Australia Day 2017 at the Ringwood Lake Soundshell for Maroondah City Australia Day Celebrations and Citizenship Ceremony. Players from Croydon Wind Symphony and Mount Lilydale Mercy College performed in a Christmas Carols by Candlelight presentation at Yarra Glen. Croydon Brass Band, Croydon Wind Symphony and Croydon Concert Band performed at the Melba Secondary College Theatre for their Annual Spring Concert. 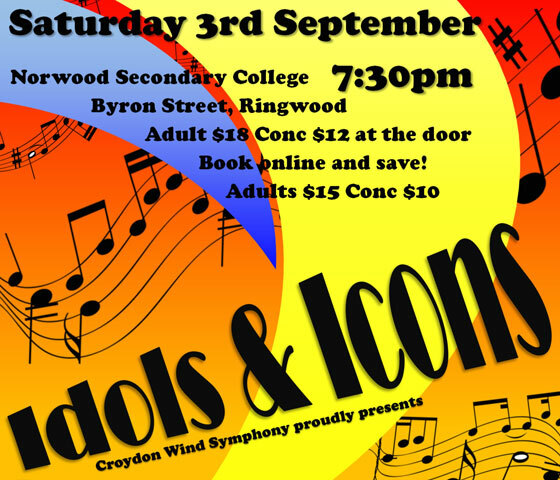 Croydon Wind Symphony staged a concert with the theme "Idols and Icons" at the Norwood Secondary College Hall. Croydon Wind Symphony performed at the Dorset Primary School Festival. Croydon Brass Band competed at the 2016 Victorian Bands League State Band Championships held in Ballarat. Croydon Brass Band members and ensemble and Croydon Wind Symphony members took part in the annual Victorian State Solo & Ensemble Championships. Croydon Wind Symphony performed at a concert with Lilydale Heights Secondary College Band at the Lilydale Heights Performing Arts Centre. Croydon Brass Band together with the Melbourne Male Choir held a concert at the Croydon South Anglican Church Hall. The Croydon Wind Symphony played on Australia Day 2016 at the Ringwood Lake Soundshell for Maroondah City Australia Day Celebrations and Citizenship Ceremony. Croydon Brass Band played Christmas Carols at the Mingarra Retirement Village, Croydon. Croydon Brass Band performed in a concert at the Sacred Heart Parish Fete at the Sacred Heart Primary Schoool. Croydon Wind Symphony performed at the Yarra Valley Strawberry Festival in Lilydale. Croydon Wind Symphony performed in the Maroondah Festival on the Main Stage. Croydon Brass Band competed at the 2015 Victorian Bands League State Band Championships held in Ballarat. Croydon Concert Band and Croydon Wind Symphony combined to organise and perform in a Dinner Dance at St John's Parish Hall, Mitcham, with guest artists Jane Hendry and Peter Noble. Croydon Brass Band and Croydon Wind Symphony members took part in the annual Victorian State Solo & Ensemble Championships. Croydon Wind Symphony performed in a concert at Ringwood Secondary College. Croydon Wind Symphony and Aquinas College staged a concert at Aquinas College. Croydon Brass Band performed at Gulf Station on an open day commemorating Gulf Station's support for Australian Troops in WWI. The Croydon Wind Symphony played on Australia Day 2015 at the Ringwood Lake Soundshell for Maroondah City Australia Day Celebrations and Citizenship Ceremony. The Croydon Wind Symphony as part of the Maroondah Carols by Candlelight Band, performed at the Maroondah Carols by Candlelight celebration on the Town Park, Norton Road, Croydon oval. Croydon Brass Band, Croydon Wind Symphony and Croydon Concert Band performed in the Maroondah Festival on the Main Stage at different times of the day. They also operated a stall to demonstrate several brass and percussion instruments. People were welcome, under supervision, to try to play them. Croydon Wind Symphony performed at the Eley Park Community Centre. Croydon Brass Band won the Open D Grade Brass competition at the Victorian Bands League State Band Championships held in Ballarat. Many thanks to the Musical Director, Melina Benger, for her work in preparing the band! Croydon Wind Symphony performed at a concert with the Lilydale Heights Secondary College Senior Concert Band at the Lilydale Heights Performing Arts Centre. Croydon Brass Band and Croydon Wind Symphony members took part in the annual Victorian State Solo & Ensemble Championships. Congratulations to the several winners in their sections. Croydon Brass Band staged a concert at the South Croydon Anglican Church. Croydon Wind Symphony performed at the Maroondah City Citizenship Ceremony held at the Karralyka Centre. Croydon Brass Band performed at the Maroondah City Citizenship Ceremony held at the Karralyka Centre. Croydon Brass Band marched in the street parade in the Celebrate Mooroolbark Festival. The Croydon Wind Symphony played on Australia Day 2014 at the Ringwood Lake Soundshell for Maroondah City Australia Day Celebrations and Citizenship Ceremony. The Croydon Wind Symphony as part of the Maroondah Carols by Candlelight Band, performed at the Maroondah Carols by Candlelight celebration on the Maroondah Secondary College oval. The Croydon Wind Symphony and Croydon Brass Band performed together with our special guest singer, Tim Barker, for the Rotary Christmas Concert for Senior Citizens of Maroondah at the Karralyka Centre, Ringwood. Croydon Brass Band performed at the Sacred Heart Parish Fete at the Sacred Heart Primary Schoool together in a concert with the Sacred Heart School Band. Croydon Brass Band, Croydon Wind Symphony and Croydon Concert Band performed at the Melba Secondary College Theatre for a concert celebrating the 51st Anniversary of the Croydon Citizens' Bands. Croydon Brass Band competed at the 2013 Victorian Bands League State Band Championships held in Ballarat. Croydon Wind Symphony and Aquinas College staged a concert at the Mahon Theatre at Aquinas College. Croydon Brass Band members took part in the annual Victorian State Solo & Ensemble Championships. Congratulations to the several winners in their sections. Members of the Croydon Brass Band performed with the Echuca Federal Band playing as part of the festivities at the Echuca Steam Rally, celebrating the 50th Anniversary of this fundraising event. Members of the Croydon Brass Band also participated in solo and small group competitions. Croydon Concert Band performed at the Box Hill Institute Information Technology Graduation Ceremony at Box Hill Town Hall. Croydon Brass Band played at the Mt Evelyn RSL - ANZAC Service & March. The Croydon Wind Symphony played on Australia Day 2013 at the Ringwood Lake Soundshell for Maroondah City Australia Day Celebrations and Citizenship Ceremony. A group of members from the Croydon Wind Symphony, Croydon Brass Band and Croydon Concert Band performed at the celebration of the 50th anniversary of the Croydon Memorial Pool. The Croydon Wind Symphony and Croydon Brass Band performed together with the Choir from the Sacred Heart Primary School, Croydon for the Rotary Christmas Concert for Senior Citizens of Maroondah at the Karralyka Centre, Ringwood. Croydon Brass Band performed Christmas Carols at the Carols by Candlelight Service at Mt Evelyn. Croydon Wind Symphony performed Christmas Carols and other items at the Cherrytree Grove Retirement Village in Croydon. A group from the Croydon Citizens' Bands performed at the Lilydale Farmers Produce Market. Croydon Brass Band, Croydon Wind Symphony and Croydon Concert Band performed at the Maroondah Festival at various times of the day. They also operated a stall to demonstrate several brass and percussion instruments. People were welcome, under supervision, to try playing them. Three members of Croydon Citzens' Bands, Ms Melina Benger, Mr David Billimoria and Ms Andrea Crompton, through their work with the band, were awarded certificates for "outstanding service to the local community" by the State Member for Kilsyth, Mr David Hodgett. Croydon Brass Band performed at St Georges Hospital, Kew for their Centenery Fete. Croydon Brass Band, Croydon Wind Symphony and Croydon Concert Band performed at the Karralyka Theatre for the 50th Anniversary Concert of the Croydon Citizens' Bands. For the finale, the Brass Band combined with guest performers from the Ringwood RSL Pipe Band. Croydon Brass Band performed at the Cherrytree Grove Retirement Village in Croydon. Croydon Wind Symphony performed at the Dorset Primary School Fete. Croydon Brass Band participated in a march and commemorative service with Vietnam Veterans and the Yarra Glen RSL to commemorate Long Tan Day. Croydon Wind Symphony performed as special guests at a concert with the Lilydale Heights Secondary College Senior Concert Band and Vocal Ensemble band and students from MacKillop College in Western Australia. Croydon Wind Symphony together with the Maroondah Singers and the Stage Presence Dance Academy performed in a concert at the Lilydale Heights Secondary College Performing Arts Centre, organised by the Croydon Wind Symphony. Members of the Croydon Brass Band performed with the Echuca Federal Band playing as part of the festivities at the Echuca Steam Rally. Croydon Brass Band performed at the ANZAC Day Service at Hookey Park, Mooroolbark. Croydon Brass Band performed at the ANZAC Service at Mt Evelyn. Croydon Brass Band performed in the wreath laying ceremony for the Loyal Orange Association at the Melbourne Shrine of Rememberance. Croydon Wind Symphony performed in the Yamaha National Band Championships Melbourne 2012. Croydon Brass Band performed in the Yamaha National Band Championships Melbourne 2012. The competition venue was the Sebel Albert Park and Citigate Conference and Hotel facility. The marching competition was held on the Lower Esplanade and Cavell Street, St Kilda. See the images. Croydon Brass Band performed in the Celebrate Mooroolbark Festival. They marched in the street parade and later played on stage. The Croydon Wind Symphony played on Australia Day 2012 at the Ringwood Lake Soundshell for Maroondah City Australia Day Celebrations. The Croydon Brass Band played Christmas Carols in Main Street, Croydon. The Croydon Brass Band played Christmas Carols in Main Street, Croydon. Some Carols were played by request from the audience. The Croydon Concert Band performed at the Maroondah City Citizenship Ceremony. All three bands of the Croydon Citizens' Bands, played at the Marooondah Festival in separate performances through the day. Three members of Croydon Citzens' Bands, Messers Graeme Agnew, Bill Dunkley and Alex Moss, through their work with the band, were awarded certificates for "outstanding service to the local community" by the State Member for Kilsyth, Mr David Hodgett. Croydon Concert Band performed at the Maroondah City Citizenship Ceremony. Croydon Wind Symphony performed at the Lilydale Heights Secondary College. Croydon Concert Band and Croydon Wind Symphony, in a combined performance, were the live band at a Dinner Dance at Lilydale Baptist Church. Croydon Brass Band provided an afternoon of musical entertainment at the Lifestyle Estates Retirement Village in Dingley Village. Croydon Concert Band provided music for the Information Technology Graduation Ceremony at Box Hill TAFE. Invited members of the Croydon Brass Band performed with the Echuca Federal Band playing as part of the festivities at the Steam Rally in Echuca. Croydon Wind Symphony performed at the Maroondah City Citizenship Ceremony. Croydon Citizens' Bands now has 40 new music stands. They are Manhassets with a solid desk but with folding feet. This makes transporting and storing them so much easier than with the usual solid feet. Many thanks to Melina Benger and the rest of the selection committee - Jenny Barker and Bill Dunkley. Thanks also to Hans Music of Main Street Croydon who were able to supply the stands at such a competitive price. © Copyright 2011-2014 - Croydon Citizens' Bands Inc. All rights reserved.